The “100 Mini Vacations” Project is done! I finished it on September 6th – a mere 603 days after I finished my first piece! Only 238 days off my original one-year goal, ha ha! For painting #1, I started in Tuscany with a scene from a 2006 trip to Lucca’s Anfiteatro. It was then fitting to end the project in Tuscany, too. 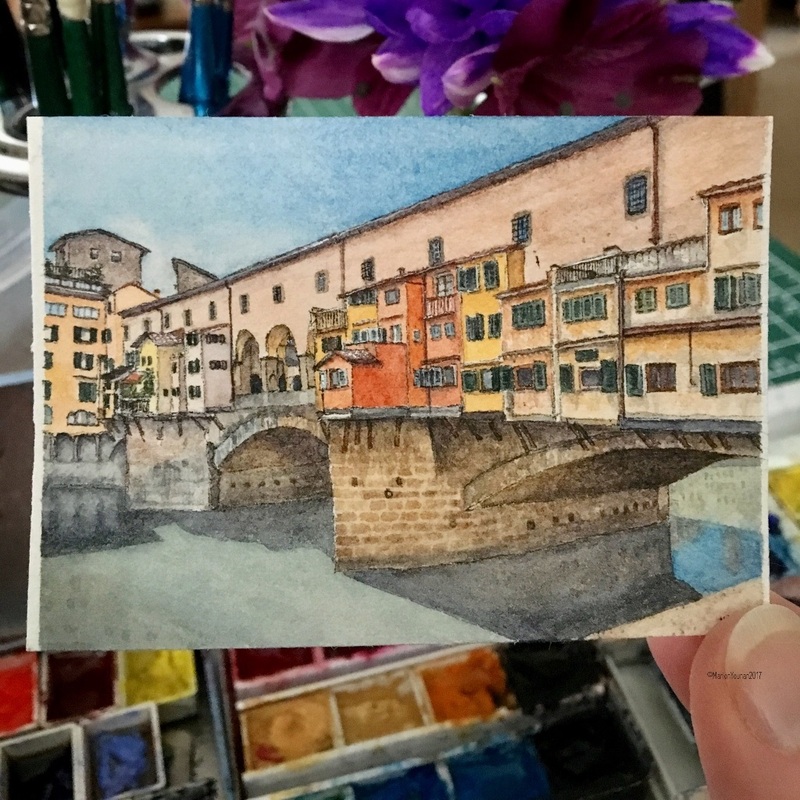 I chose a scene from a 2016 trip to Florence (my favourite travel city), the iconic Ponte Vecchio. I’ve been saving this photo subject for#100. I love this bridge because it’s again another example of how something practical is made extraordinary. 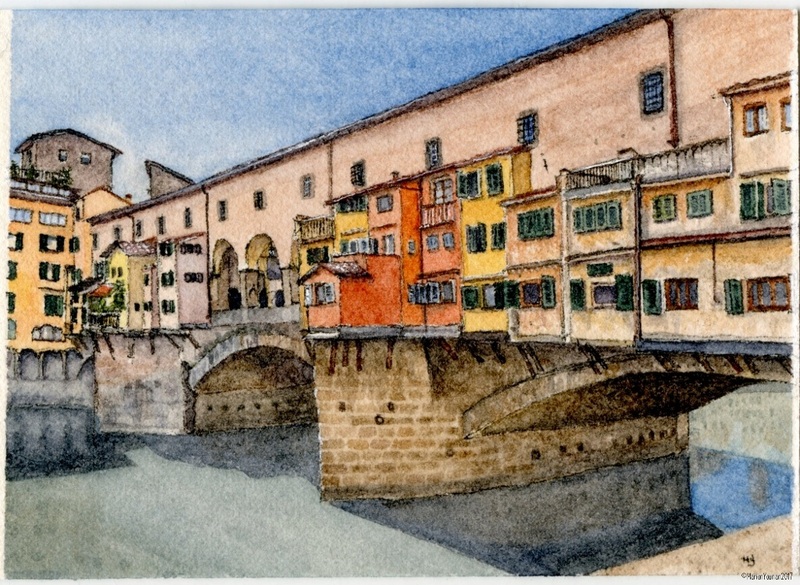 It could have just been a stone structure that allowed citizens to cross from one side of the Arno River to the other. However, it’s had these ingenious little buildings on it for centuries, initially food merchants. Then in the mid-16th century, a corridor was built above these shops linking the Palazzo Vecchio and the Pitti Palace so the reigning Duke and his family didn’t have to venture outdoors to get from their offices to their home. The shops below that mostly housed butchers were then ordered to move so that their smell didn’t permeate the corridor, and they were replaced with goldsmiths. To this day, these little shops are home to goldsmiths and jewellers, and the Vasari Corridor is a portrait gallery, part of the Uffizi Gallery. I’ve crossed this bridge dozens of times and it still amazes me. It also is the sight of a few great travel memories – the time a friend and I tailed a TV star across the bridge like 2 giggling teenagers, the night another friend and I listened to a fantastic band on the bridge under the summer stars, the search in the shops for the perfect necklace feeling very “Florentine”, and finally visiting the mesmerising portrait gallery in the Corridor after years of just missing its special opening dates. Tuscany has been a wonderful friend throughout this project, so I celebrate it with the 100th miniature! And in the next post, I’ll share a few more thoughts about the “100 Mini Vacations” project. Thanks for following along!